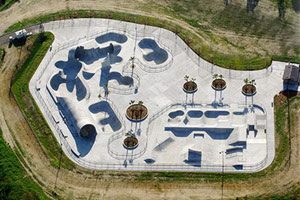 Quite possibly one of the most unique skate parks, LCRSP is in a league all its own! Riders enjoy a 70 foot long, 22 foot wide full pipe, bowls, pools, thimbles, cradles, a mega wall and a street course! Spectators can watch the action for free but must sign a waiver at the door. Bikers can join in the fun and make use of the course, however the pools are off limits!